PICATINNY ARSENAL, N.J. - Approximately 13 educators and one active duty U.S. Army Soldier, all part of the New Jersey School Board Association, visited Picatinny Arsenal on Dec. 11 to take a closer look at the installation's initiatives in promoting careers in science, technology, engineering, and math (STEM). iSTEAM stands for integrated science, technology, engineering, arts, and math. iSTEAM varies slightly from STEM but the premise remains the same: foster the importance of education and integrate the various components into a cohesive learning structure based on real-world applications. The hope is that young students will become interested in pursuing a career in one of the fields. "This position I am in now starts as a 'Recruiter', basic recruiter right out of United States Army Recruiting Command. I worked that for about 18 months," Wittmer said. "That was right here in New Jersey, out of Tinton Falls. My predecessor was from New Jersey as well. We were all from New Jersey. There were three of us in the line. I'm the third one. I'm the only one right now, and this is not being done anywhere else. "Normally a recruiter is only in charge of a few towns, a couple of zipcodes," he explained. "I can (now) travel the entire state. Most of them can only work qualified applicants, 16, 17, 18 year old students. They cannot tell their command, 'I want to go in front of eighth graders.' Me, my job is to do that. Go between pre-school, kindergarten, all the way up to the higher education levels and present these opportunities to them." One might expect that a Soldier in such a position as Wittmer's might have 15 to 20 years of experience. Wittmer has only been in the Army for nine years. His predecessors had served for 17 or 18 years before taking on such an assignment. "The real selling point for me getting the position as such a young Soldier, so to speak, was the fact that I can articulate points from the state (New Jersey)," he said. "I kind of know the other side of what it (military life) looks like to everyone else, and because I was a Bradley mechanic, I am better suited to science, and technology, and engineering, because I was working in that realm." As someone whose job was to maintain a Bradley fighting vehicle system, Wittmer's job entailed handling the maintenance and repair of the M2/M3, A2/A3 Bradley fighting vehicle, the M6 Bradley linebacker air defense vehicle, and the M7 Bradley fire support team vehicle. His new role as an iSTEAM fellow puts him in a position to help attract the Army's future engineers. "It is not even a billet, it doesn't exist," Wittmer said of his current position. "It was an opportunity that is being seized by the local recruiting command to have a fellow work hand in hand with a legitimate specialist at the New Jersey School Board Association, education specialists in their training and development department to showcase STEAM resources. "They have been trying to get the STEAM curriculum going in a lot of school districts. A lot of people don't have a collection of resources to use to educate teachers, board members, students, on what those opportunities could look like and the end result. They could see how to do it in the classroom, but what does it translate to in the real world? Who better to do that than the military? "We had to ask ourselves, 'What do we latch ourselves on to while trying to get the message across that we are a first (educational) resort, not a last resort?' A lot of people in this state, and me growing up here, being one of them, believe that the military is a last resort," Wittmer said. The Picatinny Science, Technology, Engineering and Mathematics (STEM) Education Office has a responsibility to help create a technologically proficient society able to meet the nation's workforce needs. "When all else goes wrong, go to the military," Wittmer said. "Meanwhile, they (the government) are paying for education, they are giving away credentials that you would normally pay tens of thousands of dollars for, for free, and they are giving Soldiers and trainees, the soft skills required to be successful in the workplace. "So why not do a few years, get paid, learn skills, and come out ahead of your peers? The STEAM stuff that we do is a vehicle to help get us in front of students and teachers. 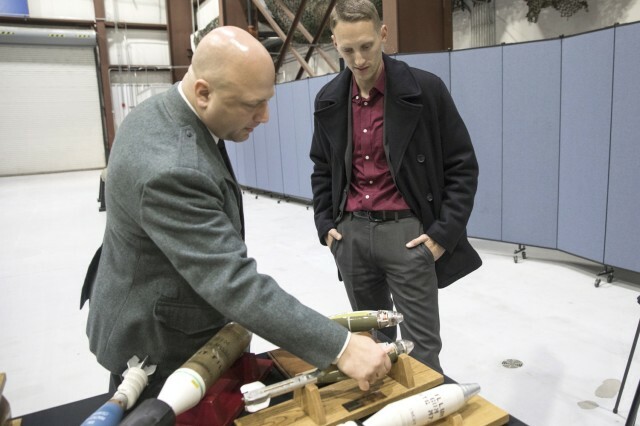 The educators visited the installation's Explosive Ordnance Disposal labs, the Armament Technology Facility, Remote Weapons Branch, Innovation Lab, Tactical Behavior Research Lab, and Homeland Defense area. 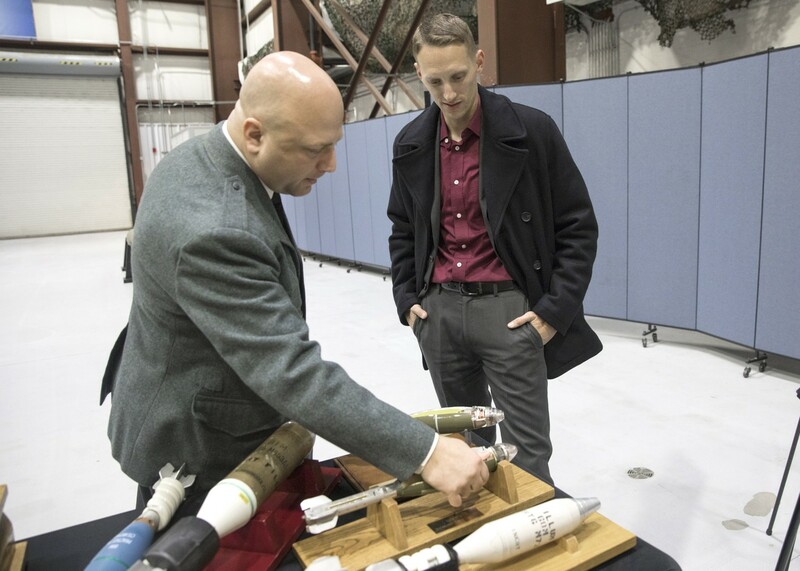 "I hope that today's visit helps to open up the eyes of the board members that are here, to show them realistically of what the Army does, give them the 'wow' factor," Wittmer said. "I hope they get to see that there are resources that are available to them, through Picatinny, through the Army, that can help inspire kids to get into these fields. "A lot of these children have preconceived notions just like they have preconceived notions of Soldiers. They might think that in order to be a scientist I have to be stuck in a room somewhere and just play with a computer. "They think that because they don't know. But then they come here and see all the hands on things, working with things, fixing things." Phyllis Alpuagh, superintendent of the Rockaway Borough School District, was one of the educators who visited the Arsenal. "My school is local. We are very interested in STEAM. This (Picatinny) is a local facility. I was very excited to come find out what is here, what the resources are. "I personally have a big connection here. My dad worked here for many years. I've been in the district for over 25 years, and this is my second in the superintendent position," Alpuagh said. "One of the biggest things I can take away from this is, 'What can I expose my students and my staff to?' There is a lot of stuff going on here. Even living locally, I don't think many people really know what goes on at Picatinny. "All the research and work your engineers are doing. I think it is a great thing. It may open the eyes of some children and help them decide what path they are going to take."